This magnificent trophy has pride of place in the SFS trophy cabinet. It was donated in 2002 by Robert Hart, son of Fred Hart who owned Aberdare. Named after a famous Queensland coal mine, she won the Queensland championship in 1933, 1934 and 1935 with legendary skipper Vic Vaughn at the helm. A very talented Brisbane jeweller and yachting enthusiast Mr W Beynon made this beautifully scaled sterling silver trophy which stands approximately 250mm high. Of note is the workmanship and attention to detail in every aspect particularly the ropes and rigging which were made of silver wire. Restoration in 2003 by W.J. Saunders under the guidance of John Stanley, ensured that the model was re-riigged exactly as the original skiff. 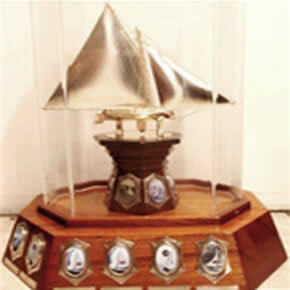 It sits on a handsome hexagonal plinth decorated with beautifully crafted shield like sterling silver frames to incorporate pictures of the winning skiffs. These two elements were fitted onto another wooden plinth bearing the engraved plate “The Galloping Ghost Trophy” to commemorate Aberdare’s national notoriety. “The Galloping Ghost” was the nicknamed given by thousands of adoring fans. A nickname which aptly describes these flying 18-footers.